The multitude of seasonal well wishes received over the past month got me to thinking. Christmas cards and actual phone calls seem to be dwindling while texts, Instagram and Facebook posts (at least at my house) are on the rise. It’s amazing to consider just how far communication technology has come. Long distance communication by man has taken several forms. Telegraphy is the transmission of ideas through symbols, unlike “pigeons” which deliver an actual message. Early examples include smoke signals, beacons, reflected light signals, and flag signals like on ships. The harnessing of electricity in the 19th century brought about the invention of electrical telegraphy, eventually leading to wireless telegraphy, the internet, and instant messaging. The first commercial telegraph system was installed in England in May 1937. Closer to home, the first telegraph lines and poles were installed in New Braunfels in 1865. The telegraph office was located in several places around town during its tenure (see NB Herald-Zeitung article by Myra Lee Goff, Around the Sophienburg, May 17, 2015). Alexander Graham Bell was awarded the first patent to “transmit sounds” on March 7, 1876. Bell Telephone was organized July 9, 1877. Finally, on December 10, 1895, when New Braunfels was 50 years old, the New Braunfels City Council passed an ordinance granting Southwestern Bell Telephone & Telegraph Company the right “to erect and maintain on the streets, alleys, and public ways, poles, fixtures and wires necessary and convenient for the purpose of supplying New Braunfels citizens with communication by telephone.” New Braunfels came of age when the first telephone lines were actually installed on January 23, 1896. The Southwestern Bell Telephone & Telegraph office was above Voelcker Store (now Red Stag) on the corner of Castell and Seguin Streets. Inside, “Telephone Girls” or “Central” worked in shifts at the switchboard. In an anonymous letter to the editor of the NB Herald on February 3, 1905, someone raved on the efficiency of the operators of Central, who answer each call on average within seven to ten seconds and processed some fifteen calls per minute or nine hundred per hour. The writer also calls out those who become impatient and “sass Central”, who by training and etiquette do not sass back. It seems the current habit of blasting an unseen person with rudeness online is not new. “Even the butcher and the baker, the grocer and the clothier keep customers waiting minutes rather than seconds before asking: “What can I do for You?” Yet how rarely a customer thinks of “sassing” a store clerk for being dilatory or negligent or stupid, even though the indifference or the stupidity or the arrogance shown is exasperating? Why make this distinction: Is it because the clerk is a living entity whose resentment will be emphatic and Central (operator) is unseen”. As New Braunfels grew, the number of telephones grew, as did the amount of business conducted by phone. In Reflections Oral History Program #32, recorded in 1977, guests Mrs. Emilie Feigerle and Mrs. Hedwig Bose shared their memories of working for the telephone company. Both ladies began their employment with Southwestern Bell Telephone & Telegraph in 1915-1916. They recalled that only women age 17 or older would be hired to run the switchboards. They reported the company being over Voelcker’s and then maybe in the Schmidt building. The operators would plug in whenever a shutter opened on the board and ask, “number?” before plugging into that slot. If someone wanted to make a long distance call, the local operator wrote out a ticket and then switched them over to the ‘toll’ operator. Twenty-four hour service was available… the night switchboard girl slept there. In 1925, the Blumberg building was built (now housing the coffee shop and offices across the street from the Courthouse). On January 1, 1926, the telephone exchange moved to its second floor. Long-time New Braunfels residents still remember the telephone office at this location. If you are curious, the Sophienburg Archives has all the New Braunfels phone books dating back to 1906. I have mixed emotions about those days. I long for that more personal connection between people, the face-to-face conversations, the slower pace of life – while I shoot off an email to my daughter and order that fantastic blouse online, on my phone. 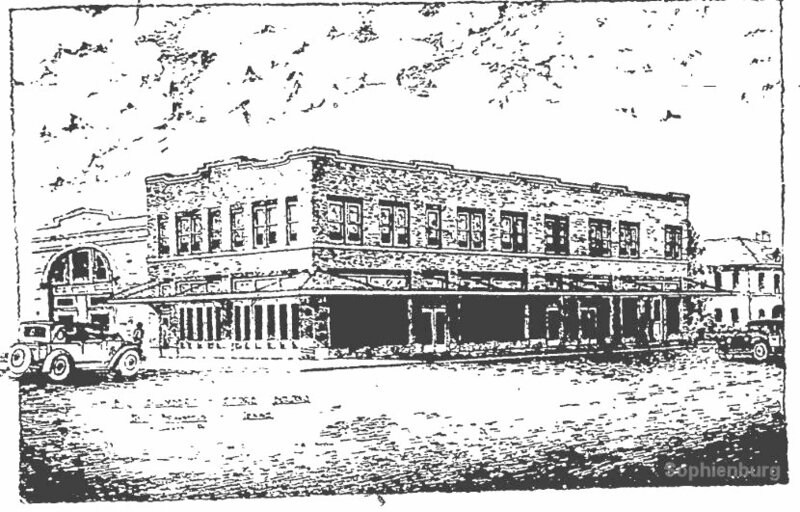 Conceptual drawing of the 1925 Blumberg Building (now Crosswalk Coffee and offices).